The 2013 National Geographic photo contest is well under way, and in annual tradition, the contest is serving the important purpose of reiterating the fact that your travel photos are no good. No seriously, these are mostly “amateurs” submitting photos to the contest, and even the worst of the lot makes the best travel photos of ours look like something our 11-year-old cousin posted on Instagram using their 3GS. But if you think you are one of the few whose photos rise to the level of contest winner, be sure to enter the contest before it closes on June 30 for your chance to win the grand prize of a 10-day Galápagos National Geographic Expedition for two (second place is a 7-day National Geographic Photography Workshop and third place gets you a 6-day cruise on a Maine windjammer schooner for two). And for some some inspiration and to see what the competition is up to, check out the weekly editors’ picks, broken down into the categories of travel portraits, outdoor scenes, sense of place, and spontaneous moments. 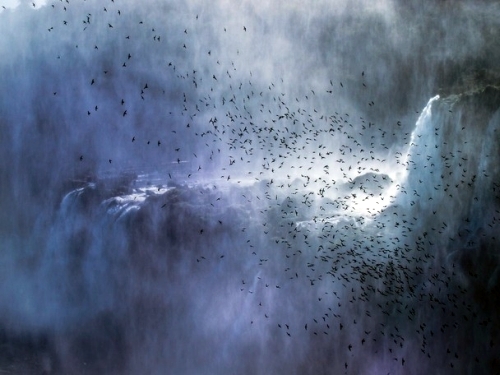 My favorite for week 6 is the ethereal above shot by Francesco Filippo Pellegrini who captured a flock of swifts while visiting Iguazú Falls, Argentina. Sigh, I’m selling my camera tomorrow.